Eugene verboeckhoven 1798/1881 and peter frans note 1779/1842. The Dutch school court early nineteenth. 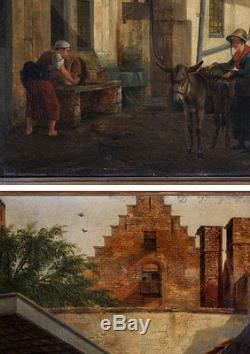 Bottom right with double signatures and dated 1838 or 1839 age: Dutch school from the beginning of the 19th. 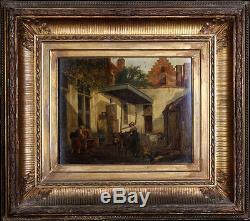 Theme: technical genre scene: oil on oak panel light restorations - good condition size: with frame 72 x 65 cm - 28.3 x 25.6 inches frameless 39 x 32 cm - 15.4 x 12.6 inches frame: in wood and stucco gilded with gold leaf of the time of the table small gaps and wears. 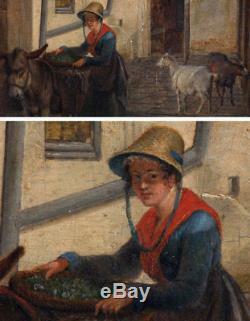 Very beautiful oil painting on oak panel painted 2 hands eugenes verboeckhoven and peter frans ii note. 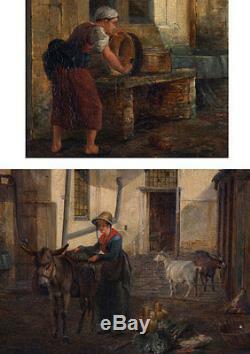 Two very great Dutch painters on the very high coast that can reach more than 70,000 or more. Painter landscape and animal portraitist, he studied with his father Bartholomew. At first he became a skilful sculptor and painter, and his paintings had an international renown during his lifetime. Performed following the process of "blaireautage" that made the paint smooth and velvety, his paintings were bathed in a golden light characteristic of his most beautiful works. His fame was international in his lifetime and received many awards in several countries. 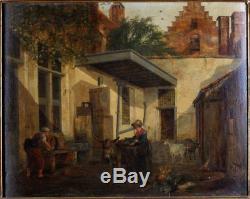 Mainly an animal painter, it is more rare to find subjects like this "back yard of a Dutch house". This subject has been more widely treated by Peter Frans. He is present in the museums of new york, paris, london, amsterdam, berlin, frankfurt, montreal, munich etc. Peter frans ii note 1779/1842. Painter, sculptor, draftsman and engraver. Son of the architect pierre françois le vieux and was the pupil of jf van geel. He has mainly painted landscapes and city views by highlighting the architectural prowess of Dutch houses. 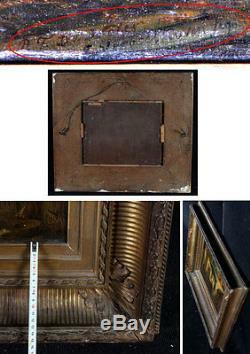 It is also present in many museums including cork, amsterdam, cologne etc. Table sold with invoice / certificate. And visible to our gallery by appointment on avignon. The item "eugène verboeckhoven and peter frans note, signed, Dutch school early 19th" is on sale since Thursday, August 31, 2017. It is in the category "art, antiques \ art of the nineteenth and before \ paintings, enamels". 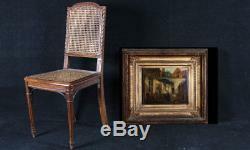 The seller is "galerie-artableaux" and is located in avignon.